This is a tutorial that details the default browser requirements for visitors to a Composr site. It also contains a lot of historical information, as understanding the development history is useful for understanding the current browser landscape. In the beginning the only mainstream web browser was Netscape Navigator. Microsoft soon realised it needed a browser too, so launched Internet Explorer. Towards the end of the 1990s, after Microsoft started seriously competing with Netscape rather than only matching it, there was a very fast period of Internet development. Microsoft and Netscape both created technologies and submitted them to the W3C for standardisation, and the two browsers developed head-to-head, until Netscape essentially went out of business due to loss of sales when Internet Explorer was bundled with Windows and all ISPs switched to supporting it instead of Netscape Navigator. As Microsoft woke up to their popular competition from Firefox, they sped up their development again: releasing Internet Explorer versions 7 through 11, then the new 'Edge' browser. Parallel to Microsoft speeding up, Google Chrome (based on Safari's Webkit code) came along and ate up significant market share from both Firefox and Microsoft. Google Chrome now has a big lead because it is a high quality cross-platform browser, heavily promoted by Google. Google forked Webkit to create the Blink engine. Opera threw out their own engine and started using the Blink engine. † These browsers auto-update, so we support the latest versions only. †† We officially support the last two releases of these browsers. In practice we are likely to accept bug reports for older browsers if they are still widely used by relevant demographics. ††† As IE is particularly widely-used and inflexible we are more explicit about what we will support. Officially it is still the last two releases, but we will accept bug reports for IE9-IE11, and maintain a basic level of frontend support for IE8). The exact supported versions will change over time, as install bases change, and this tutorial will be updated accordingly. We also provide support for high quality text-mode browsers such as 'Lynx' and browsers designed for people with disabilities. The inherent nature of this support is that it is partial support for an 'accessible' experience, rather than a 'whizz-bang' experience. 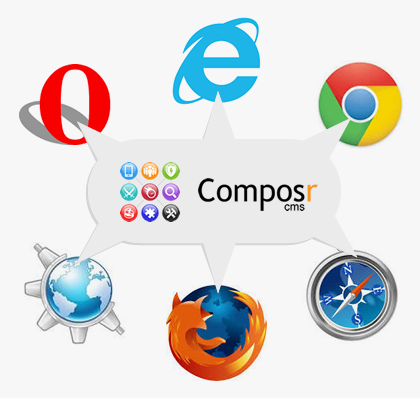 BrowserStack are kind enough to provide free testing capabilities to the core Composr developers. It is a high-quality service. A machine can only have one Microsoft browser installed. To test on mobile devices you really should test on a proper mobile device to get a real feel for things. Safari only works on Mac OS, so you need a Mac. Internet Explorer only works on Windows, so you need a Windows install. On browsers such as Google Chrome operating system font rendering differences may mean things lay out slightly differently on different operating systems. Google Chrome has excellent device emulation, for quick/earlier testing for different mobile devices (not a substitute for proper testing). Internet Explorer lets you run in compatibility modes to test on earlier versions of their engines (imperfect, but useful). IETester lets you test much older Internet Explorer versions (imperfect/unstable, but useful). Virtual Machines let you test different Internet Explorer browsers without needing separate physical machines. Microsoft supply free images to help. They come at a hefty download size though, uses lots of disk space, and using VMs means lots of RAM usage. Composr does not require cookie support, although it is recommended. To at least have 'session cookies' enabled is strongly recommended, as otherwise Composr will need to carry additional data along in the URL. A screen-resolution of at least 1024×768 is strongly suggested, as this is the minimum resolution that we design the default theme for. It is not usually appropriate for a printed webpage to look like it does on the screen. For example, margins would want removing from each side of the site, social media links should not show, background images should be disabled, and so on.